Hortus Camdenensis | Rosa centifolia L.
A Centifolia rose. Gore describes the flowers of the ‘Common Cabbage’ as drooping, large, of a beautiful pink, fragrant and full. Paul describes its flowers as rose-coloured, large and globular in form, on a vigorous bush of branching habit. [Paul (1848, 1863, 1888, 1903), Rivers (1854, 1857, 1863), Amat]. 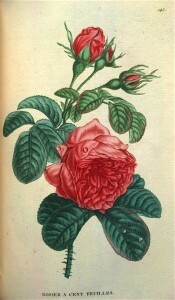 An old garden rose, certainly pre-19th century. Rosa centifolia is beautifully illustrated in Willmot, rose no. 115. Saint-Hilaire Tr. pl.143/1825. More details about Rosa centifolia L.